The farm is located approximately 21 miles North of Springfield, MO on Highway 13 or 5 miles South of Bolivar, MO on Highway 13, then 3 miles East on 490th RD. The entrance to the farm is located on the North side of the road at the yellow farm house. Here is the sign at the gate entrance. 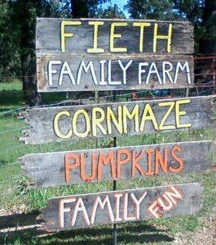 Providing affordable country fun at the farm located at 1663 E 490th Road, Bolivar, MO.